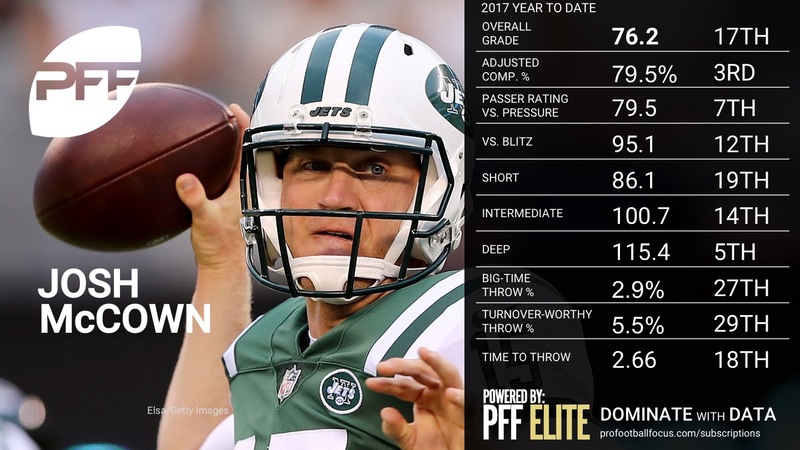 PFF Analysts Steve Palazzolo and Zac Robinson give you an overview of every team’s quarterback, and where they rank in terms of overall PFF grade as well as detailed notes on a select few who stood out for good, or bad, reasons in Week 8. 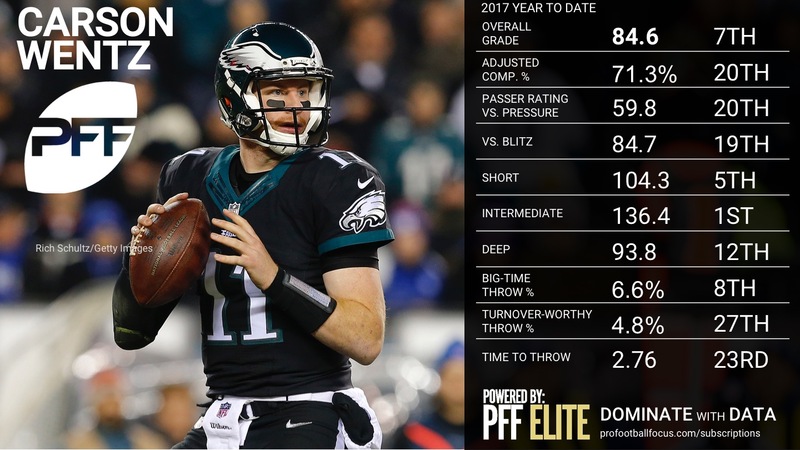 These rankings are based on their overall grades after Week 8, and can be found as a part of the PFF Edge subscription. 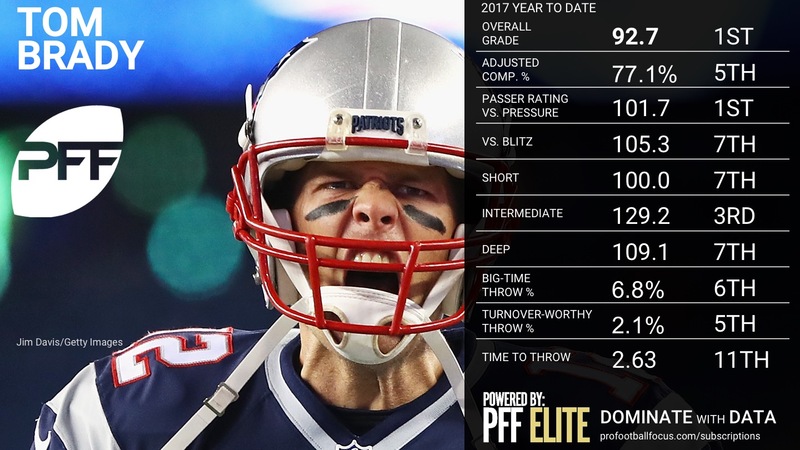 Brady had another fine game, maintaining his spot as the top-graded quarterback in the league. 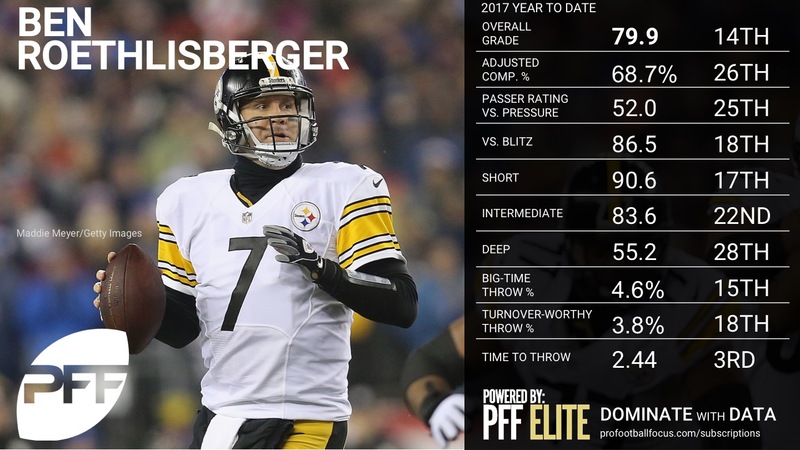 He took good care of the ball against the Chargers despite being pressured on 42.0 percent of his dropbacks, sixth-highest in the NFL this week, and his 81.0 percent adjusted completion percentage also ranked sixth. Brady’s two best throws came to TE Rob Gronkowski up the seam, the first of which was dropped, and he did his best work at the intermediate level where he hit 8-of-12 for 144 yards. 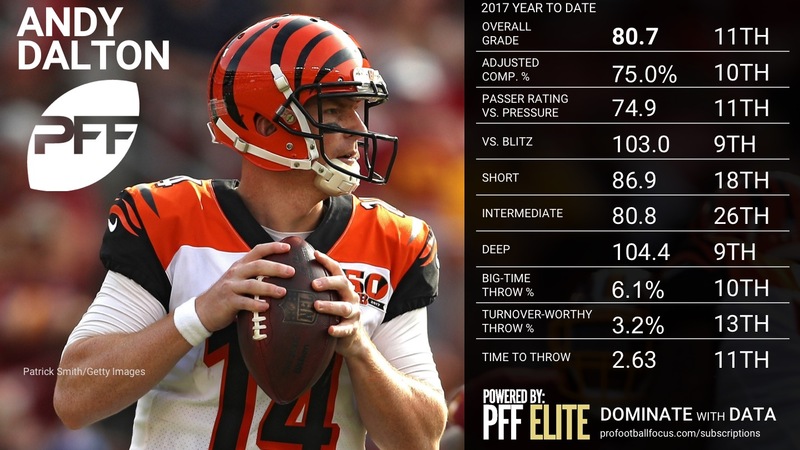 The Wilson-Watson shootout was a must watch Sunday afternoon coming down in the end to Wilson making a few more big plays and a couple less mistakes. 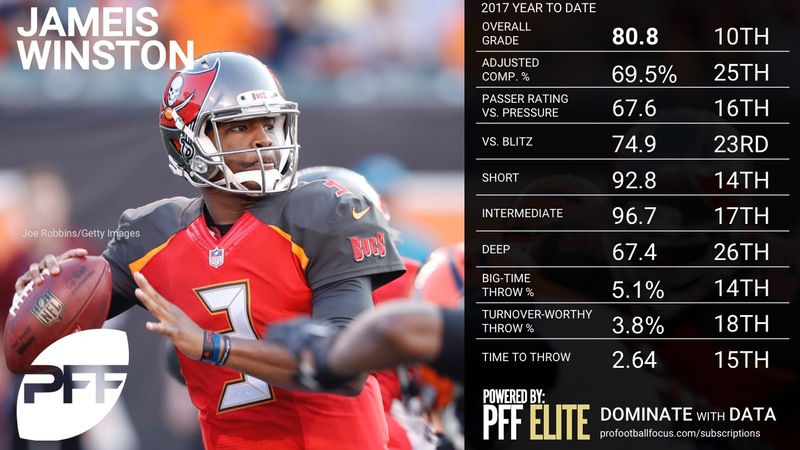 Wilson littered the field with #BigTimeThrows and consistently hit his receivers in stride or put the ball up in spots his playmakers could make a play on, ending the game going 5-of-7 for 202 yards and a touchdown on deep throws traveling 20 plus yards in the air. Wilson had his typical share of Houdini plays, including a scramble play where he escaped left and somehow found Paul Richardson in the end zone across the middle of the field for a touchdown in the first quarter. 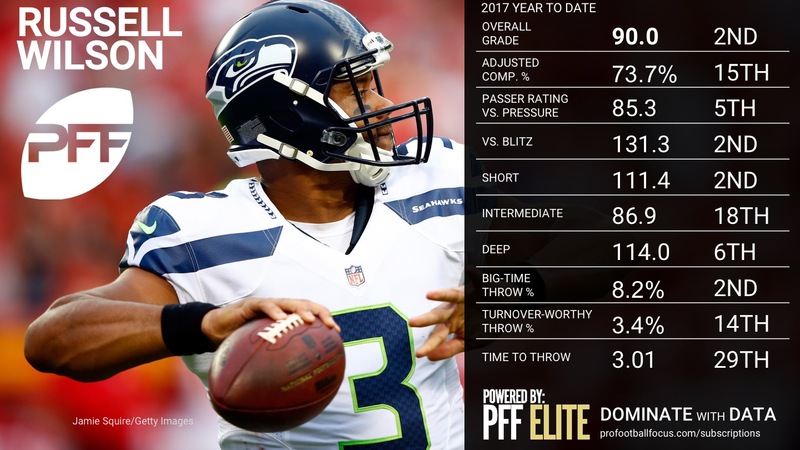 Known for getting hot on streaks where he is virtually unstoppable, Wilson is throwing the ball with supreme accuracy and zip his past two outings. 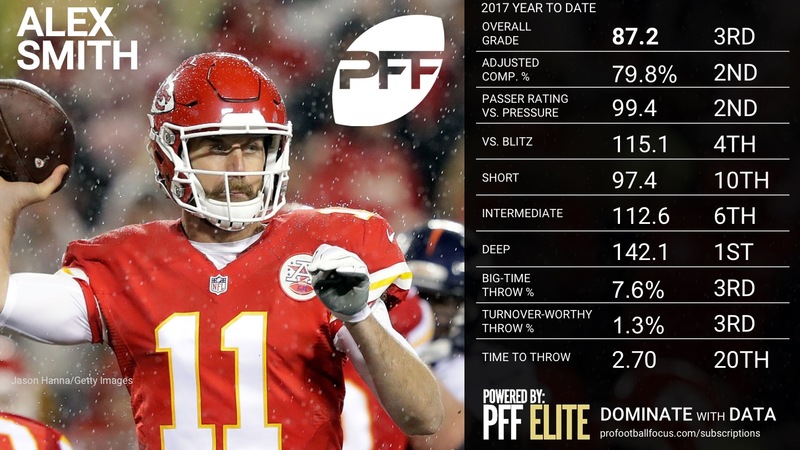 Ball location simply hasn’t been on par for Ryan this season, but this was his best game of the year despite playing in the rain against the New York Jets. 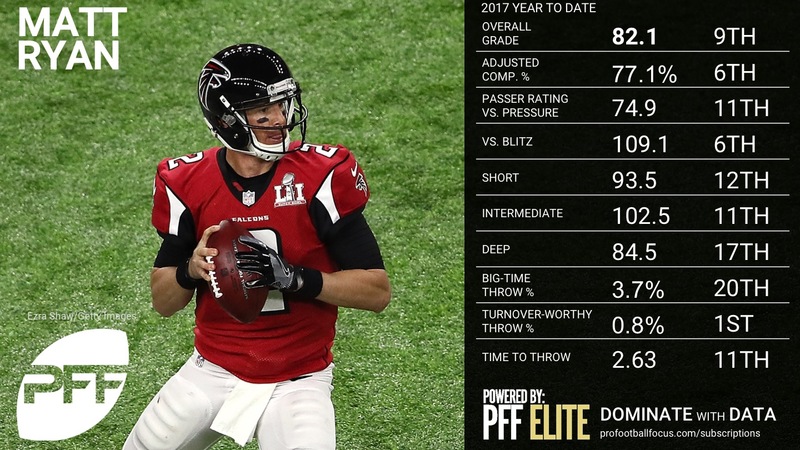 After ranking last in the league in adjusted completion percentage on deep (20-plus yard) passes through seven weeks (17.4 percent), Ryan hit all three of his deep shots including a well-placed post route to Julio Jones for a 53-yard gain. 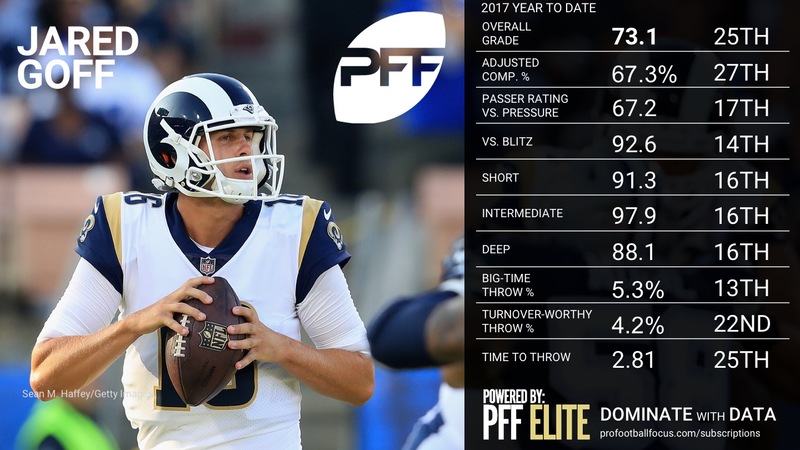 While the big plays have been a season-long struggle, this may be the breakout game Ryan needed and he’s still doing a fine job of taking care of the ball, leading the NFL with the lowest percentage of turnover-worthy plays. 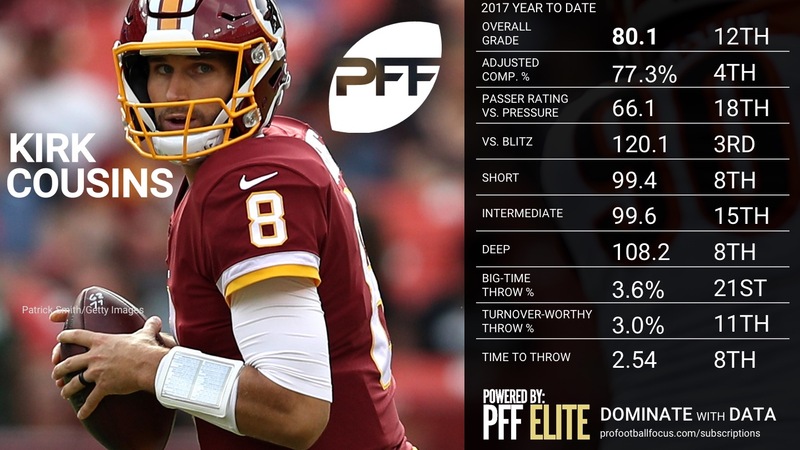 Cousins hung tough behind a makeshift offensive line and a receiving corps that did not help him out much throughout the game. 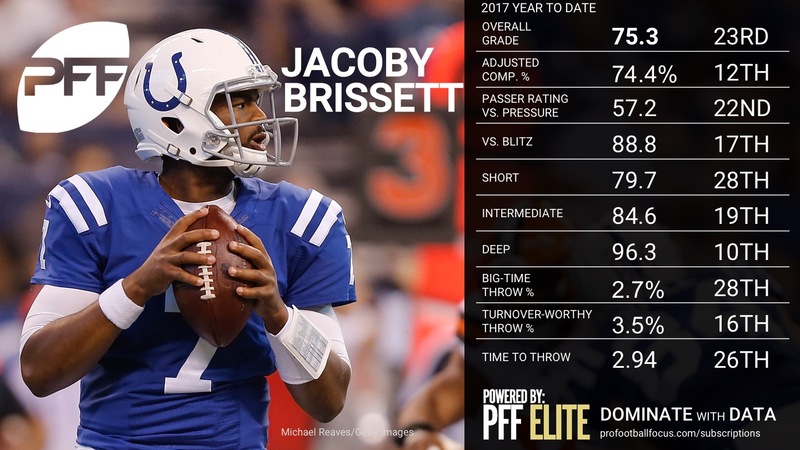 He made one of the best throws of the week on a seam route to Jamison Crowder off of his back foot under pressure, and threw the ball relatively accurate for the majority of the game considering the sloppy and rainy conditions. Cousins was on the bad end of some drops that could have resulted in big plays as the four drops by his receivers left 57 yards in air on the table, not to mention potential run after the catch opportunities on a couple of them. He lucked out with a dropped interception by Jaylon Smith in the fourth quarter, only to come back with a batted pass tipped up in the air and returned for an interception that sealed the game. 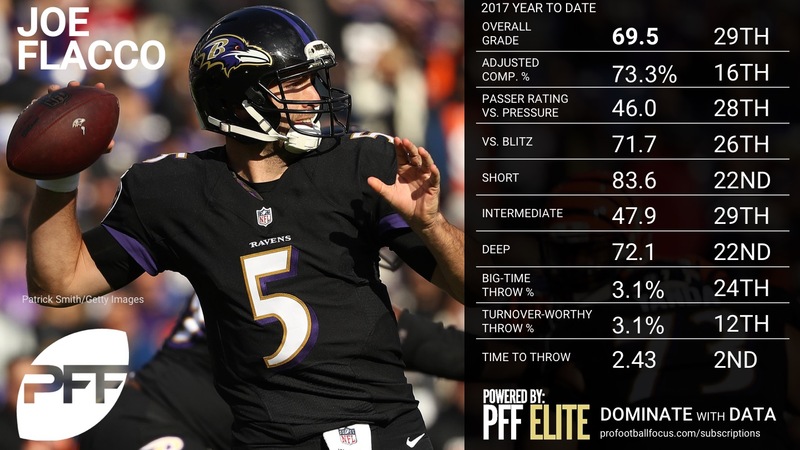 On a day where the margin for error he was working with was very small, Cousins and his playmakers were unable to make enough big plays to keep pace. 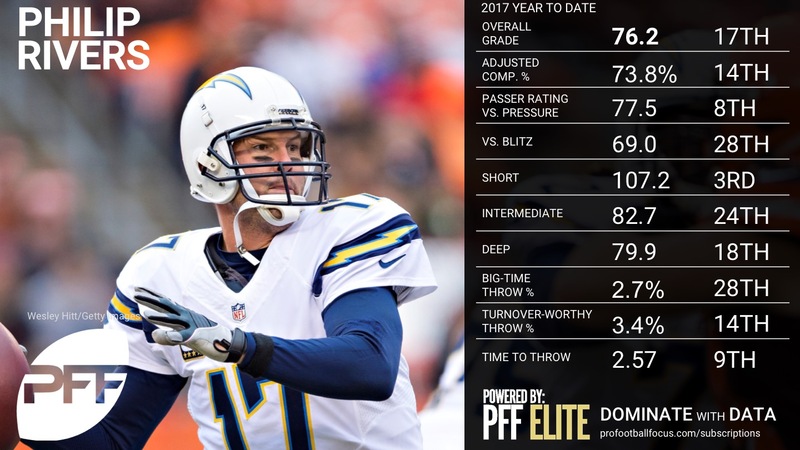 Rivers was solid overall, but his game was marred by a few key mistakes. 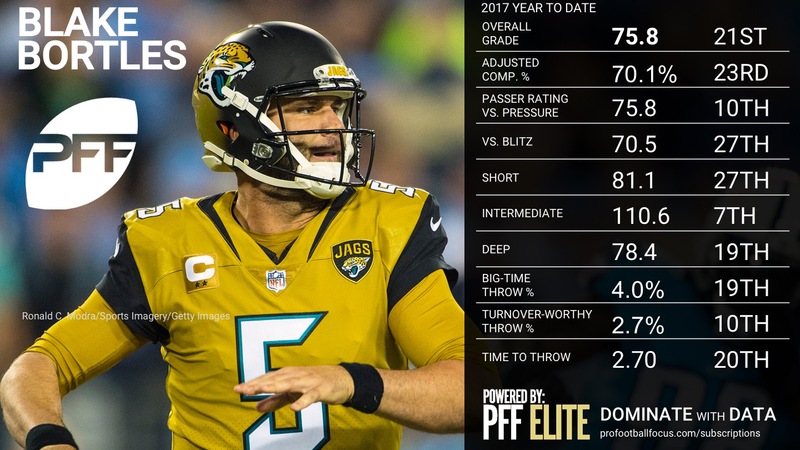 He had a bad fumble that led to a huge loss for a sack and he missed a number of throws in the fourth quarter, including a two-point conversion attempt and his throw on the last play of the game that didn’t make it into the end zone to give his receivers an opportunity to make a play. Still, Rivers showed good middle-of-the-field touch and his fourth quarter deep ball was a beauty for a 24-yard touchdown. 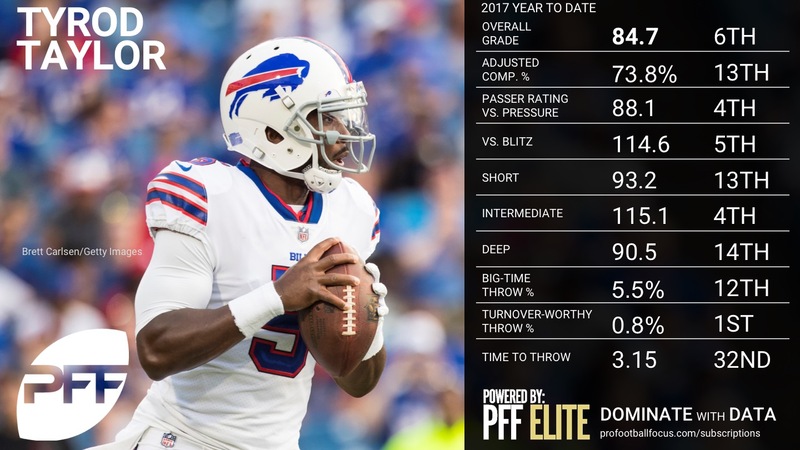 A week after a solid performance against the Chiefs, Carr was inconsistent against a tough Bills defense. 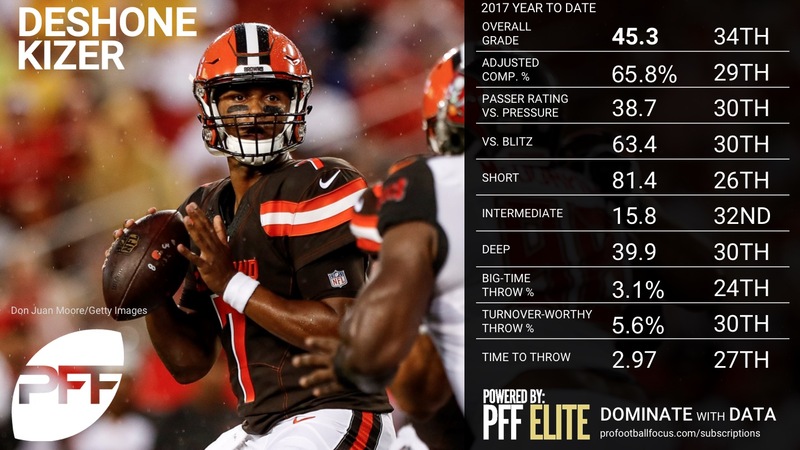 He started the game strong, with a few big throws down the field and up the seams in the first quarter to get on the board, but there wasn’t much going after that. 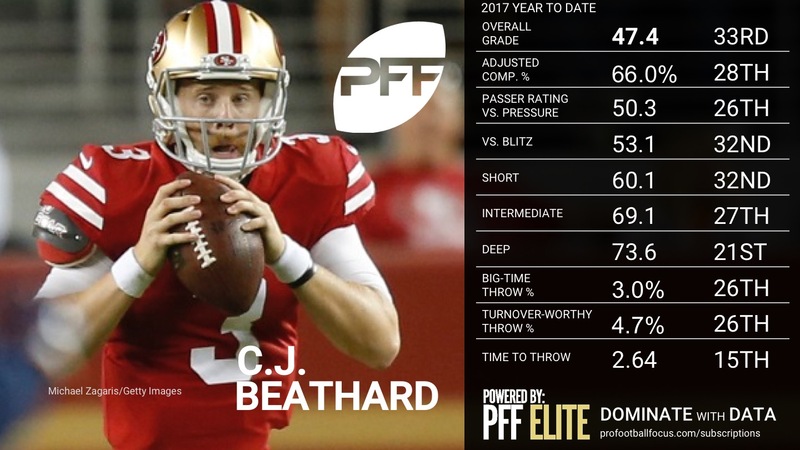 Carr forced a few throws including a seam in the middle of the field that was tipped up in air and intercepted by safety Micah Hyde. 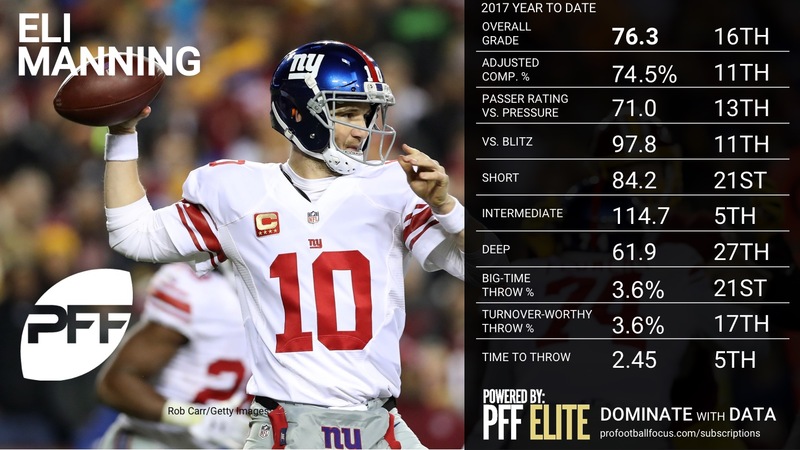 A year after his stellar play garnered even some MVP talk at certain points, Carr has played with less poise and had an up and down year to date. 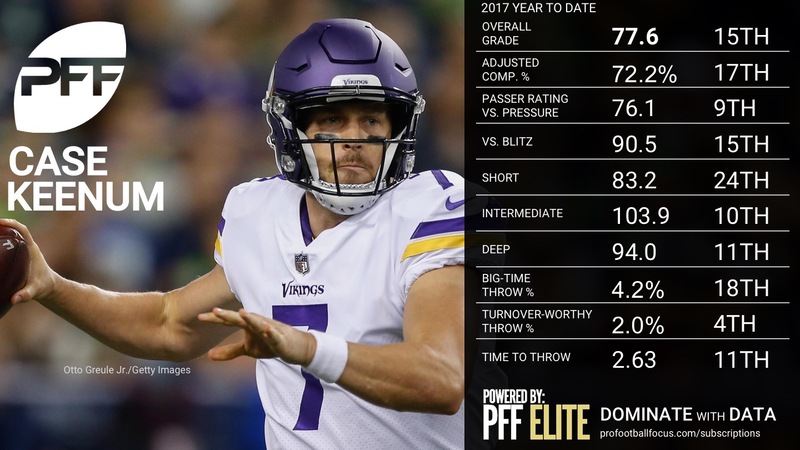 Known for typically being a bit of quick triggered player, Carr seems to have taken that to the extreme with 72.6 percent of his throws coming under 2.5 seconds, most in the NFL. 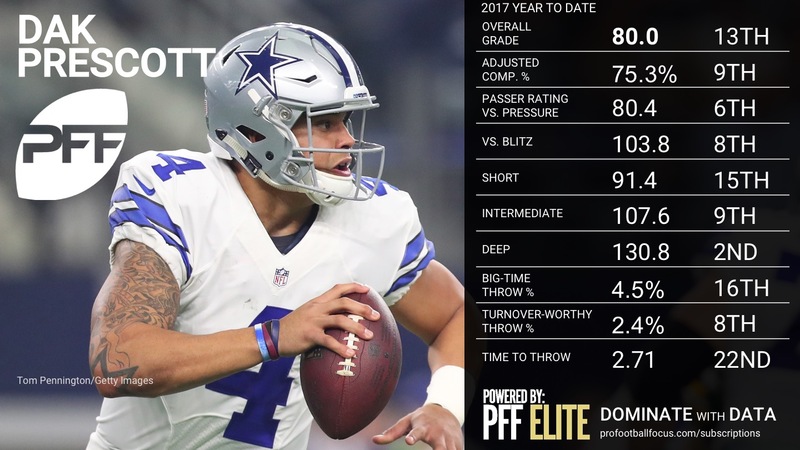 Conversely on plays where he’s released the ball after 2.5 seconds, he has completed just 43 percent of his throws, second-lowest in the NFL and a bottom fourth passer rating of 72.6. 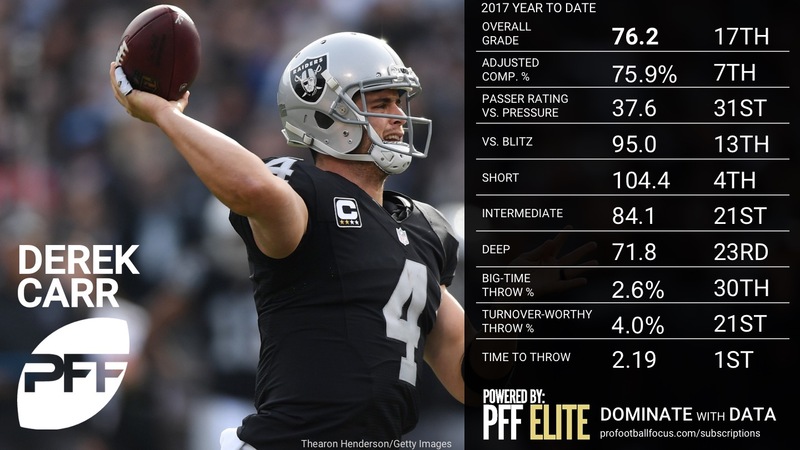 The lack of play action used by the Raiders this season is also alarming, with just 9.9 percent of his throws coming off of play action, lowest in the NFL. 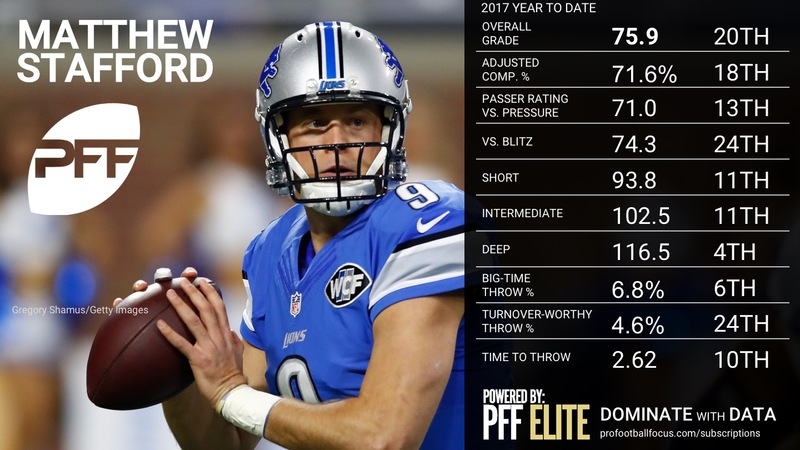 When Stafford is on, he’s as fun to watch as any quarterback, and he got off to a great start against the Steelers with a number of big-time throws. 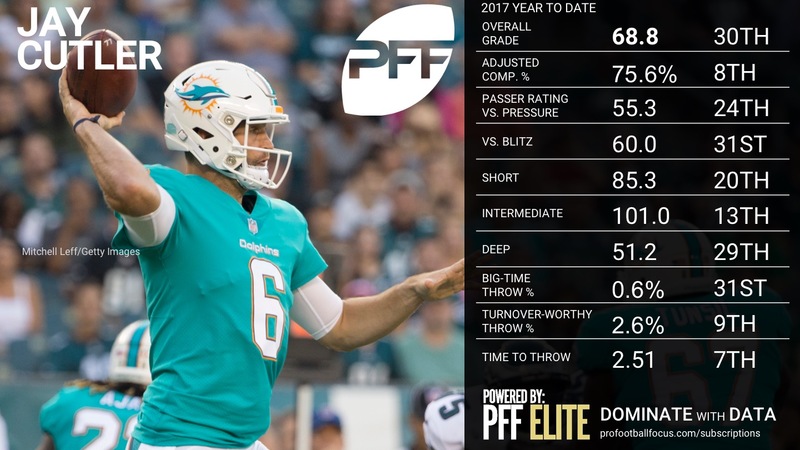 From well-placed deep passes to Cover-2 shots, Stafford may have had his best game of the season from a pure throwing standpoint, but this game will be remembered for an inability to capitalize in the red zone. 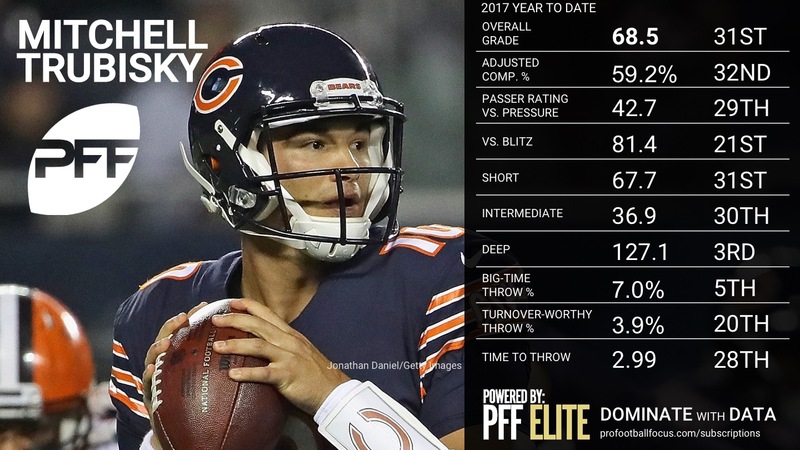 Stafford made a poor late-game decision with the game on the line as he forced a pass agianst the 3-man rush instead of looking to extend the play, but overall, it was one of the better games Stafford has played in a while. 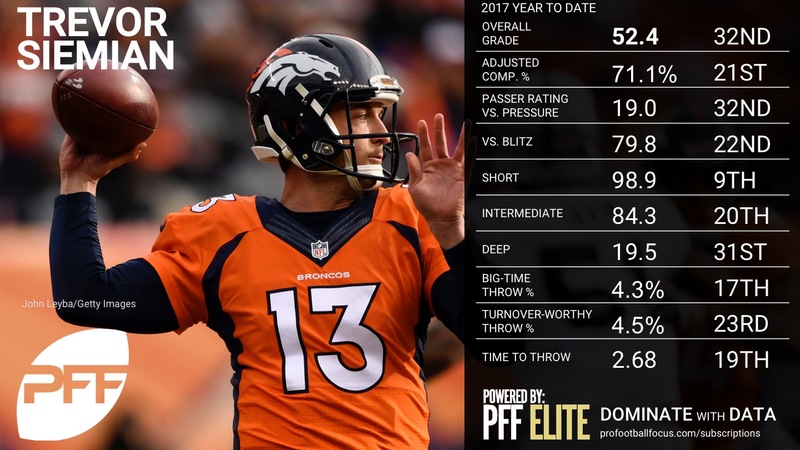 Watson gave us what we saw from him in college each time he stepped on the field in big games, doing the unthinkable at times in Seattle. He tested the big names of the Seattle secondary all day, starting off launching a bomb to Will Fuller off of play action on a post route over the top of middle of the field safety Earl Thomas for the first score of the game and one that certainly set the tone for the day. 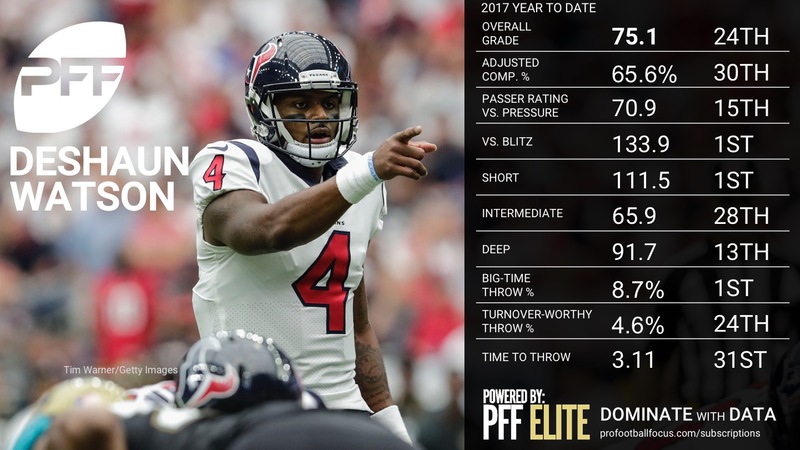 He attacked Richard Sherman on the perimeter a number of times, finding DeAndre Hopkins for big gains on ‘go’ routes in tightly contested spots. 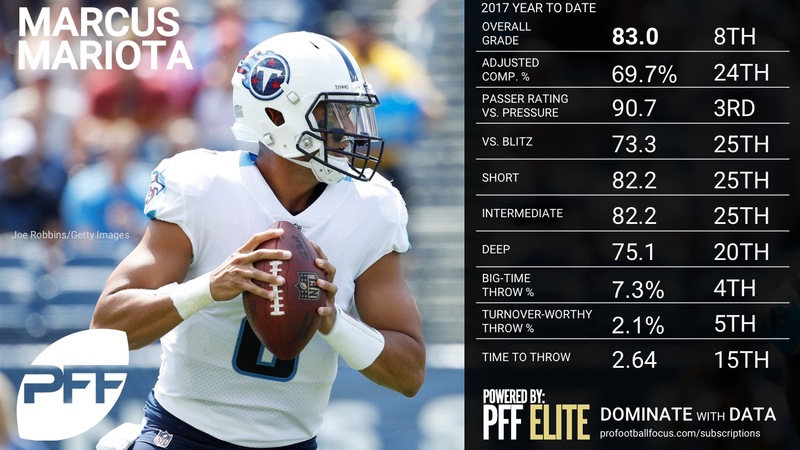 Much like Wilson, Watson was able to hit open guys in stride and put the ball up for his guys down the field, going 7-of-10 for 222 yards and two touchdowns on deep shots traveling 20 plus yards. 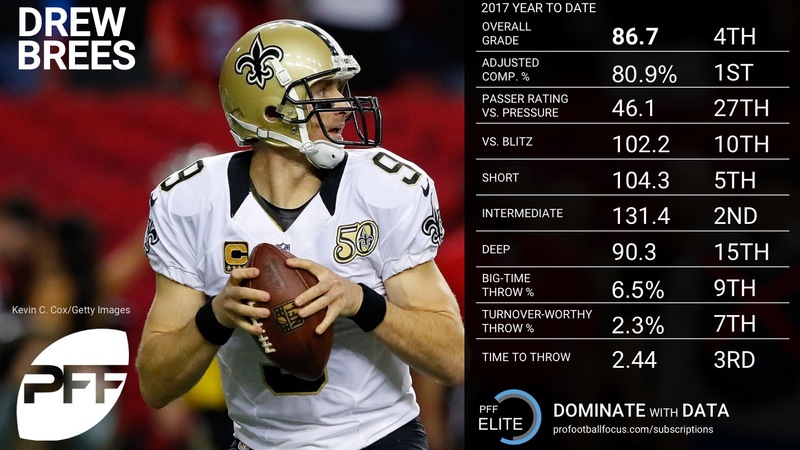 Thomas and Sherman were able to get some revenge as Watson had a couple of mistakes with a misread of coverage and a forced throw that resulted in interceptions. 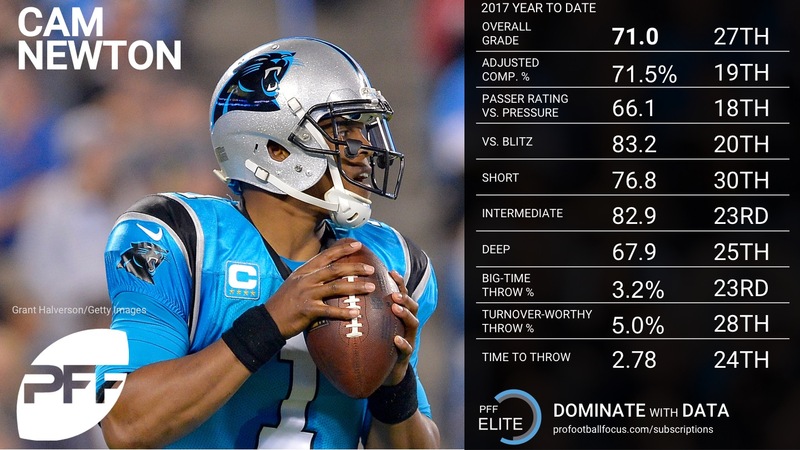 Whether it was the big plays down the field or his escapability and timely first down runs, Watson was spectacular throughout.